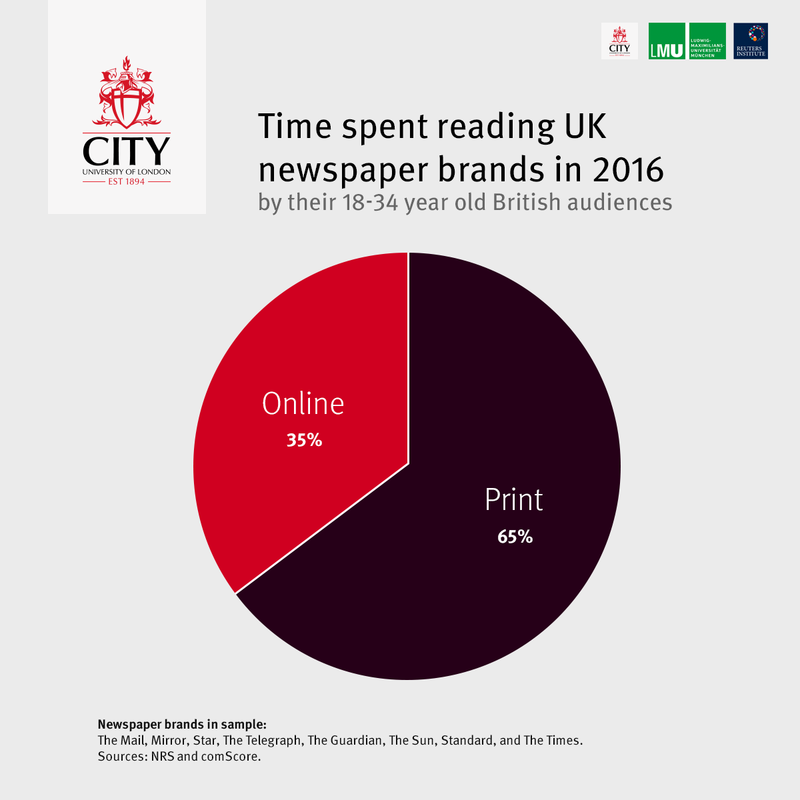 Readers aged 18 to 34 are spending nearly twice as much time with newspapers’ print editions than with their websites and apps, according to a new study. In 2016, the 18- to 34-year-old British readers of eight UK national newspapers spent a total of 21.7 billion minutes reading the news brands’ print editions, but just 11.9 billion minutes using their websites and apps. 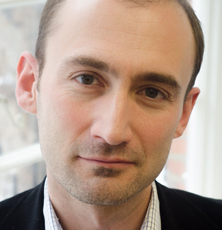 The researchers, led by Professor Neil Thurman of City, University of London and LMU Munich, used a large-scale survey and online user measurement to investigate the total time spent with newspapers in print and online. The results show that, despite falls in the circulation of newspapers and increases in news consumption via smartphones, readers of all ages still spend more time with newspapers’ ‘dead-tree’ editions than with their websites and apps. The study shows that newspapers’ 18- to 34-year-old print readers spend an average of 23 minutes reading each weekday print issue (and more on Saturdays and Sundays). However, those same newspapers’ 18- to 34-year-old online readers visit the brands websites and apps for an average of less than one minute per day (43 seconds). The report reveals one exception to this trend, the Daily Mail. Brits under 35 spend more than twice as much time with the brand online than in print. Although most newspapers are attracting more attention from younger readers via their print editions than via their online channels, the young are spending less time with newspaper brands than they used to, even though digital distribution has made access easier and cheaper. The report compares the time spent with newspapers in 2016 against the time spent at the turn of the millennium. Overall there has been a 40 per cent drop, with much larger falls in the attention coming from younger (-64 per cent) and middle-aged (-57 per cent) readers than from the older (-14 per cent) audience segment. However, some newspaper brands have bucked this downward trend in visibility. 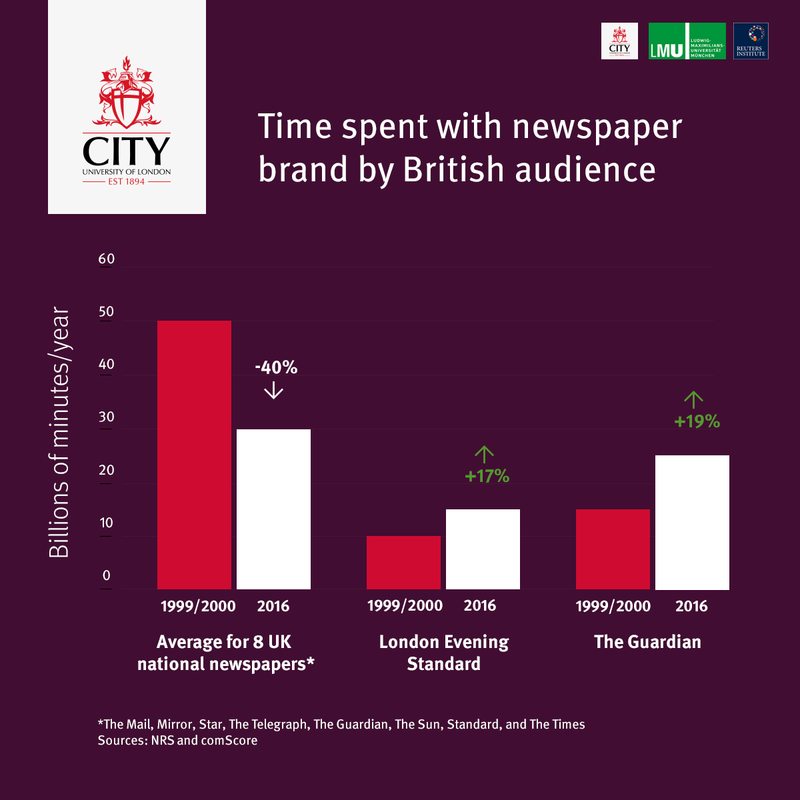 The report found that the total time spent with the Guardian and the London Evening Standard by their British audiences had actually increased since the turn of the millennium, by 19 per cent and 17 per cent, respectively. In the case of the Guardian, the report credits the gain to the title’s relatively successful online editions, which have attracted more attention than has been lost from declines in its print readership, and to Brexit and Trump ‘bumps’ in print readership in 2016. In the Standard’s case, becoming a freesheet in 2009 boosted readership—and, as a result, time spent with the brand. The report calculated the total time spent with eight UK newspaper brands (The Mail, Mirror, The Sun, Star, Standard, The Telegraph, The Guardian, and The Times) by their British print and online (PC and mobile) audiences (aged 18 and over) using data from the National Readership Survey and comScore. Titled, Has Digital Distribution Rejuvenated Readership? Revisiting the Age Demographics of Newspaper Consumption, the report was authored by Professor Neil Thurman of City, University of London and LMU Munich and Dr Richard Fletcher of the Reuters Institute for the Study of Journalism at the University of Oxford. The report is published in the international peer-reviewed journal, Journalism Studies.